Keep these facts in mind the next time you read anything about immigration. It’s getting hard to keep up with immigration news updates. Just last week, the White House’s reform proposal was leaked—prompting Republican outrage over a lack of focus on border security. The White House responded that it was simply a backup plan and that President Obama reached out to GOP lawmakers working on their own immigration bill. Now that everyone in Capital Hill has made nice, Senator McCain, who has flip-flopped on immigration for years, found himself squabbling with anti-immigrant Arizona constituents. The coming weeks promise more of the same between a White House that has already leaked its own plan, the Senate’s Gang of Eight that is apparently still crafting one, a reluctant House that may stall any efforts at comprehensive reform, a visible and vocal undocumented population that’s taking a seat at the table and advocates on all sides of the debate. Then, there’s Immigration and Customs Enforcement, or ICE, whose Border Patrol agents garnered nearly one million dollars in cash, vacation time and Home Depot gift card incentives to target people for deportation—including many US citizens. ICE officials and agents tend to make their own rules, and Obama hasn’t reined them in. 1) Immigration is a civil—not criminal—issue. 2) The borders are already secure. Net migration from Mexico to the United States is already at zero. And Border Patrol apprehensions of unauthorized crossers are down to levels not seen since 1971. Part of that has to do with the poor economy—but it also illustrates heightened enforcement at the border, including the use of new technologies. At least ten Predator drones patrol the borders, including one used at the Canadian border in North Dakota. 3) Deportation targets are at an historic high. If the Obama administration continues to remove undocumented immigrants at its current rate, more than 2 million people will be deported by 2014. That’s roughly the same amount of people who were deported between 1892 and 1997. While the administration claims that it targets undocumented immigrants who have been convicted of crimes, a major study released today reveals that nearly 80 percent of immigration detainers were placed on people who had no criminal record whatsoever. While detainers do not always result in deportations, they always have vast repercussions. Perhaps chief among them is the fact that because deportations proceedings are a civil matter, there is no right to due process—even for the more than 700 US citizens with no criminal record who found themselves with an immigration detainer between 2008 and 2012. 4) There’s a revolving door between ICE and private prison corporations. An information request revealed last week that ICE officials instructed agents to scour Department of Motor Vehicle databases for potential immigrants to detain. The request yielded several emails sent to and from David Venturella, who served as ICE’s assistant director between 2008 and 2012. During that time, the Center for Investigative Reporting explained that the private prison corporation, GEO Group, “pointed toward anticipated growth of federal detention, particularly immigrants.” (You can read more about my visit to one such GEO Group facility last month here.) ICE’s Venturella appears in the same post, divulging that his agency would be requesting the construction of new detention centers. According to this LinkedIn profile, Venturella left his post at ICE to join the GEO Group in July. 5) Immigrants are good for the economy. Economists on the left, right and center agree that immigrants benefit the economy. 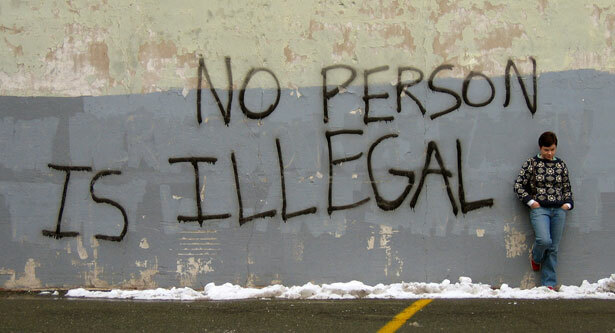 Undocumented immigrants contribute billions of dollars each year in sales, property and personal taxes. And while undocumented immigrants are ineligible for most welfare benefits, documented immigrants are far less likely to use benefits than non-immigrants. Read Greg Kaufmann’s list on 10 things you should know—but that the media may not tell you—about the Temporary Assistance for Needy Families, or TANF, program.